Now guests can control such in-room functions as lighting, temperature. drapery. They can also set privacy controls and make staff service requests from Crave’s guest tablet. The idea of being able to control your surroundings with the twitch of a nose, the wave of a wand, or, in this case, the flick of a finger took a quantum leap closer to reality this week. 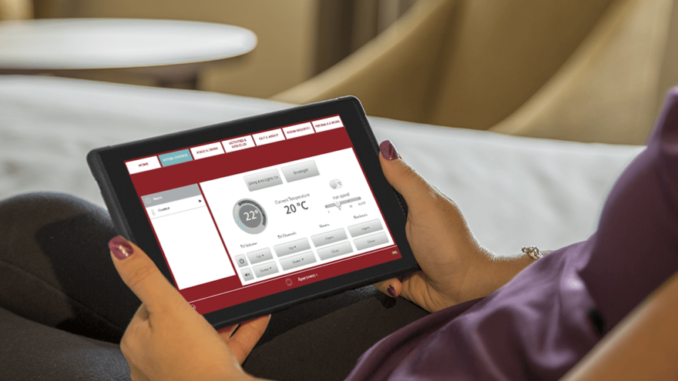 That’s because Crave Interactive, a provider of guest-room management solutions, announced that it has integrated the room-control API from the INTEREL, a leading provider of energy management and advanced guest room management systems, into its guest-room tablets. The combined technology is being aptly described as “one touch total room control.” Indeed, guests can control such in-room functions as lighting, temperature. drapery, all from a guest tablet. They can also set privacy controls and make staff service requests. The combined system is designed to provide guests with more options for controlling their hotel environment, leading to an improved experience overall. The first live Crave / INTEREL integration was launched in The Ruby Collection on the Gold Coast of Australia, allowing guests to control the room ambiance with a just few clicks.